Luxury yacht VABOSA is a stunning and quick vessel built by Azimut in 2018 and featuring the naval architecture of the shipyard. At 23m/74ft, this compact luxury yacht is ideal for family and friends charters and her lightweight GRP hull and superstructure provide a maximum draft of 1.8m/6ft, providing excellent access to shallow waterways and sheltered bays. The modern accommodation sleeps up to eight guests over four beautiful and large en-suite cabins with a crew of two for expert service throughout any trip. Guests arriving by tender will step aboard via the swim platform, which has room for sun chairs and accesses the main deck aft via the staircases. In the shaded cockpit, a C-shaped sofa faces forwards and a raised dining table can be used for meals, as well as spreading out with hobbies. 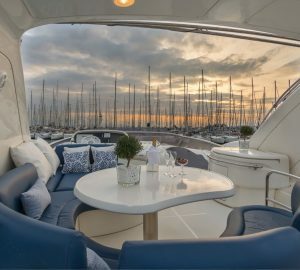 As an alternative place to dine, the foredeck uses a similar setup in front of the helm station, and after a hearty meal, guests can unwind on the bow sunbed. The flybridge is accessed via a starboard staircase from the main deck cockpit. 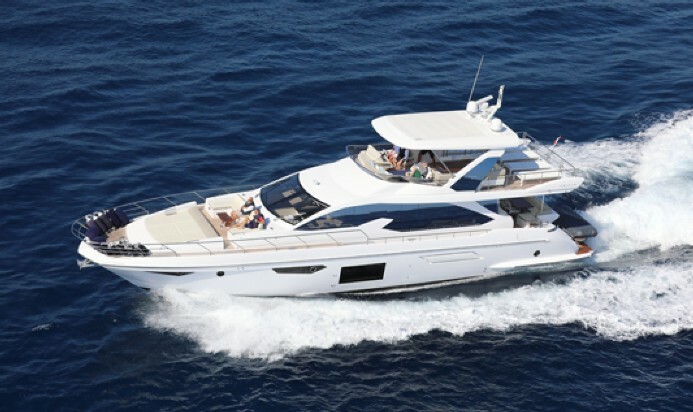 The flybridge aft section is covered in sun loungers with a nearby barbeque for quick alfresco meals. The mid-section has a C-shaped port-side sofa beneath a retractable Bimini roof. Forward, the helm station takes up the starboard side, while to port a corner sofa enjoys constant sunshine. The beautiful modern interiors contrast the soft white furnishings and pale floors with dark frames around the windows and beautiful accents in Makassar wood. The lower deck contains the guest accommodation of a Master suite, two double cabins and a twin cabin. The crew accommodation and tender garage are also located on this deck, leaving the main deck free for an open-plan salo,n that stretches from the helm station to the aft glass sliding doors. The formal dining area is placed directly behind the starboard helm station to benefit from the daylight streaming through the windscreen and the sizeable adjacent window. The galley is placed to port and the lounge farther aft, provides guests with a sumptuous sofa curving around a coffee table and an additional armchair is placed against the opposite wall. A pair of MAN CVR engines produces a top speed of 31 knots and a cruising speed of 25 knots. The accommodation sleeps a maximum of 8 guests across 4 en-suite cabins that each have TV entertainment, and the layout includes: 1 Master suite containing a mirror integrated with a TV and two seats either side of a window table, as well as 2 double cabins and 1 twin cabin. The crew of 2 will ensure that everyone on board has everything they need while maintaining a discreet service.